What the Lord wants He gets! How else can one explain why He granted permission for a bunch of penniless sinners in Lanka to hold one of the biggest events in His name? The bus stops at 133 Street and Liberty Avenue. The lady exits and runs to the roti shop for shelter from the rain. In no time she starts a conversation with one of the shoppers. She has this friend who has a daughter. The problem is that the daughter was involved in a business wedding. She was supposed to divorce the man in a few weeks. But now he is refusing. He wants to stay married. She has someone else and was in the marriage only for the money. What advice can one possibly give? She wants to cut out, he wants to stay in and there are others like them. The attorneys on Liberty are refusing this one! Guyanese American attorney and Politician charged with Election Campaign Fraud in Richmond Hill Queens New York. 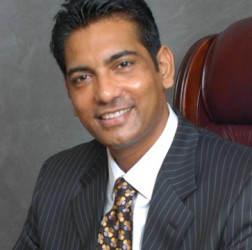 October 24, 2012 – Capitol News – A Guyanese American politician in the Richmond Hill section of Queens New York, has been charged in a scheme involving allegedly, the use of Straw Donors to funnel multiple illegal contributions to his 2010 New York City Council Campaign.